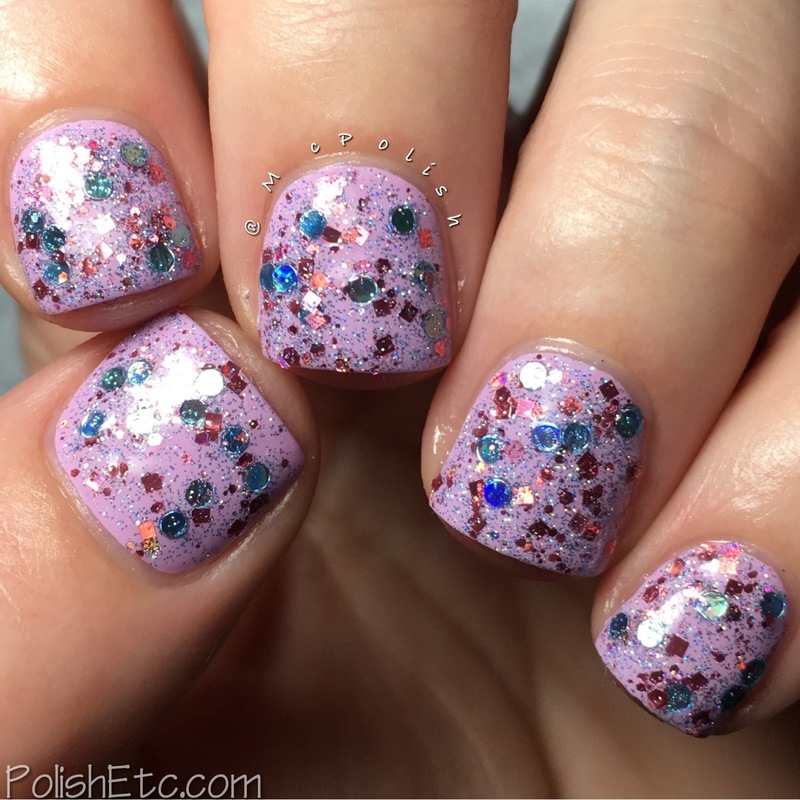 The Whimsical Valentines Collection 2017 - Polish Etc. I have another fun little collection from Whimsical Ideas by Pam to share with you all! Pam likes to release collections that are inspired by the holidays each year. This years Valentine's Day collection is a nice one. 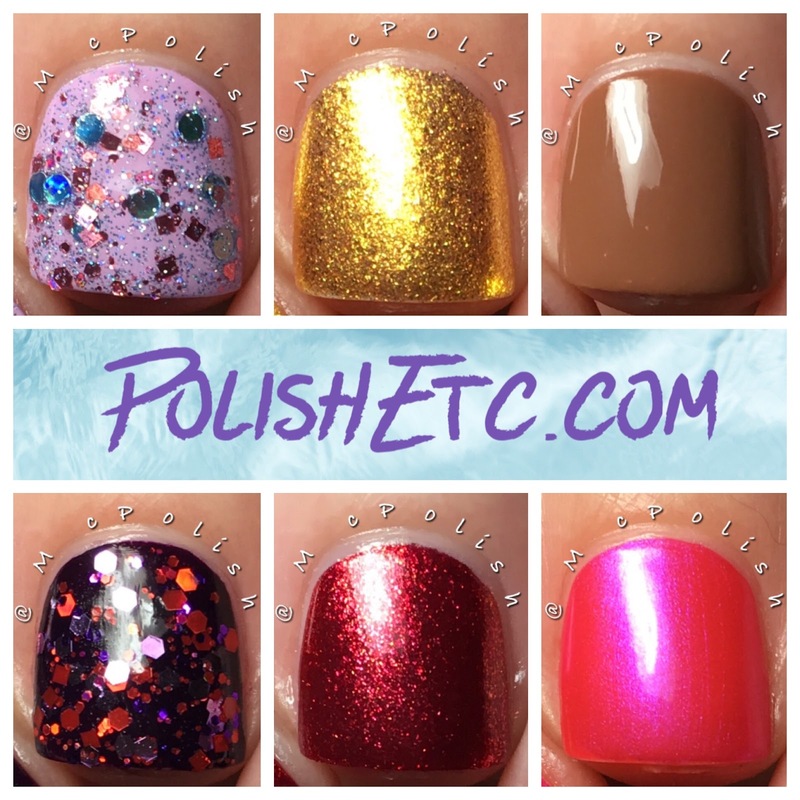 There are some nice shimmers and glitters here. I sure everyone could find a something they like in this mix. There are six new shades in total and they just released this past weekend. Let's take a look! 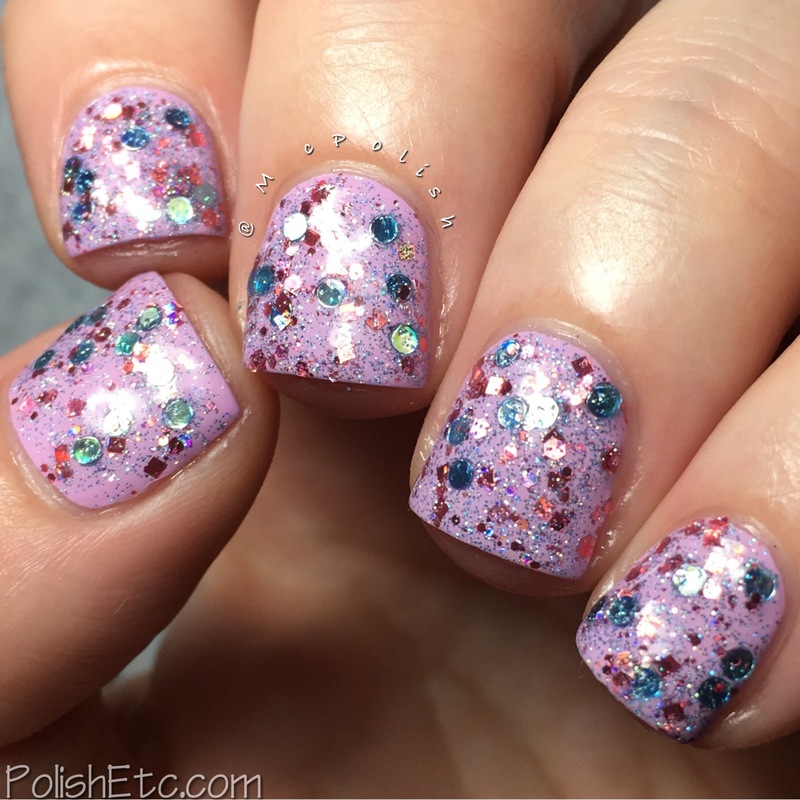 Guys and Dolls - A clear base glitter topper with baby blue holo dots, pink holo squares and hexes with pink and blue microglitter. This is a fun little topper! There is great glitter pay off and lots of sparkle. You would think that a pink and blue polish would scream 'baby shower' but this one has more of a springtime feel. 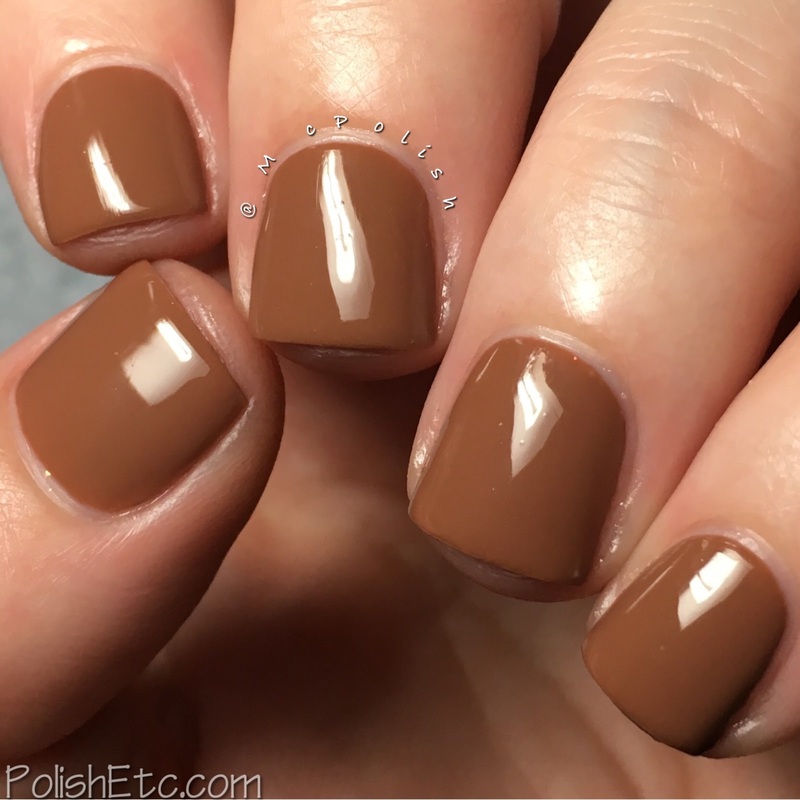 I am showing you one coat over China Glaze's Sweet Hook with a glossy top coat here. 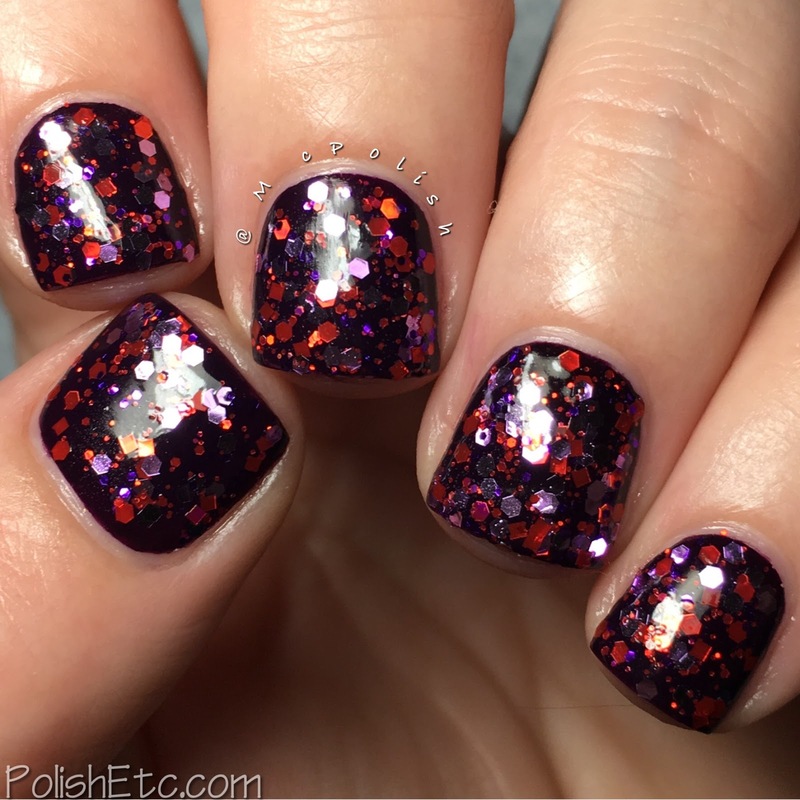 My Funny Valentine - A clear based glitter topper with red and purple metallic glitters in various sizes. 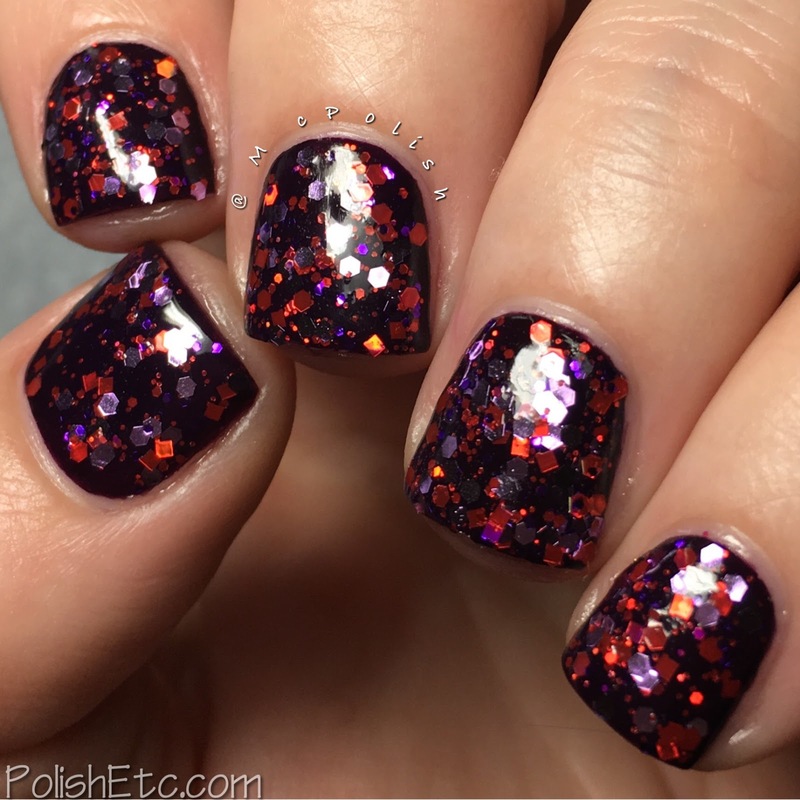 I love paring red and purple together, so the glitter is a nice one. Again, very good glitter payoff. 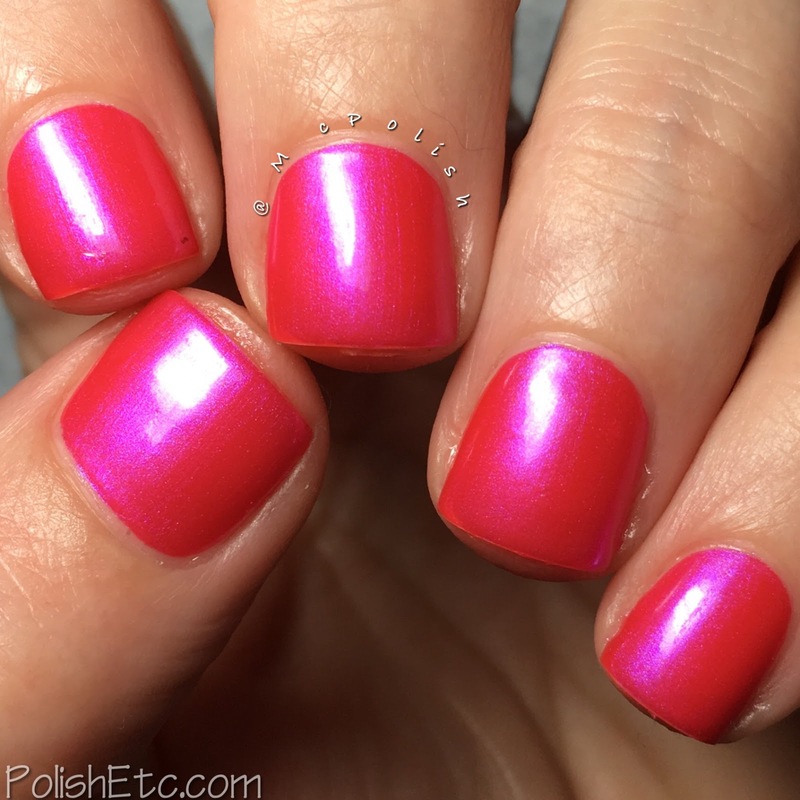 I am showing you one coat over China Glaze's Crimson with a glossy top coat. 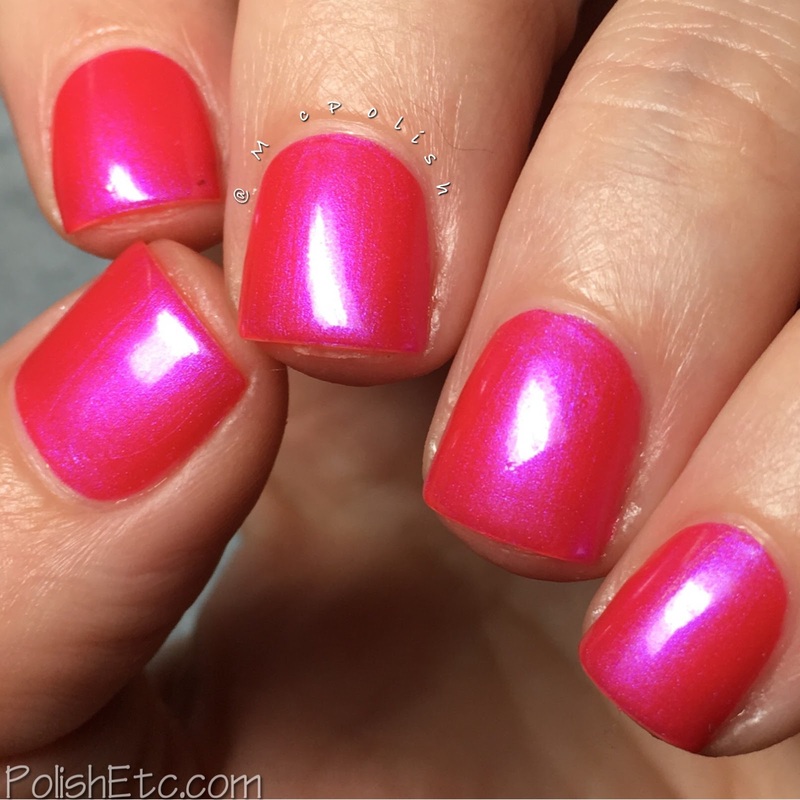 Happily Ever After - A bright fuchsia pink jelly with intense purple shimmer. 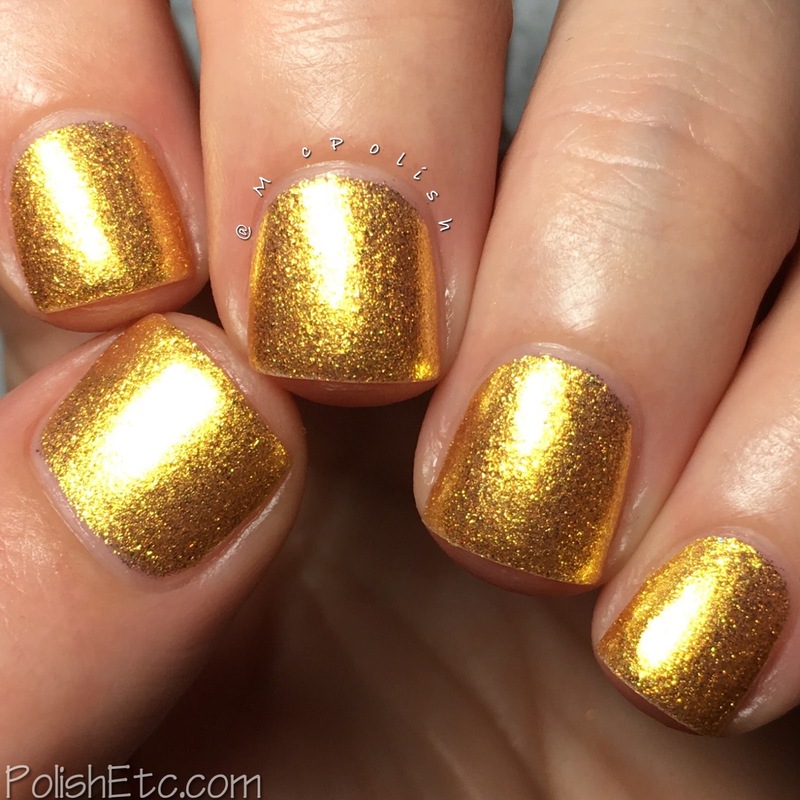 This polish is so bright, it practically glows. It is a little on the sheer side though. I needed three coats and you can still make out my visible nail line. The formula was nice a smooth though. 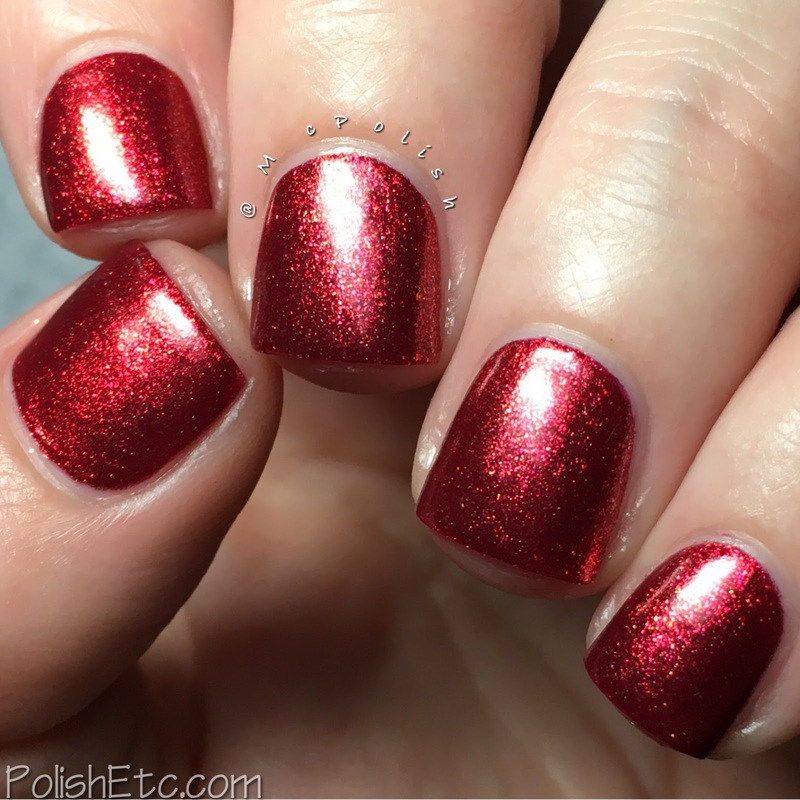 Red Velvet - A deep ruby red creme packed with golden metallic shimmer. 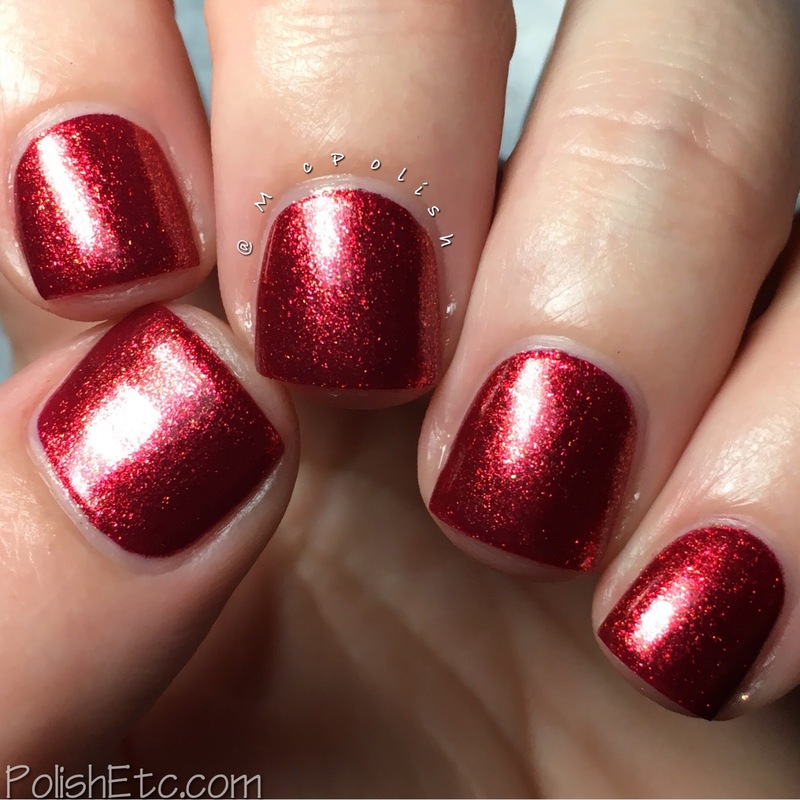 These shimmery reds are always a crowd pleaser. It is perfect for both Valentine's Day and for Christmas! The formula was great and very opaque. I am showing you two coats with a glossy top coat here but you could totally get away with one coat if you were careful. 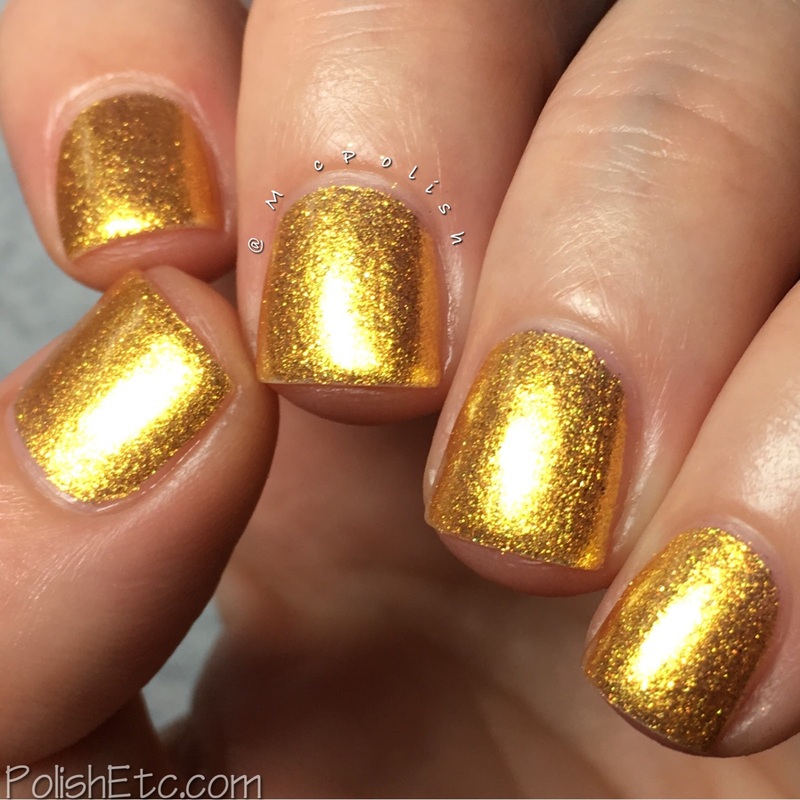 Nugget - A bright yellow gold metallic full coverage microflakie. Maybe I am describing that correctly? It is bright and shiny and shimmery. The base is clear but it is packed to the max with all of these yellow gold metallic bits. I got it opaque enough in three coats but I bet this would look cool as one coat over a colored base as well. My camera refused to capture a color accurate macro of this. It just kept coming out lime green. Sorry. Moose - A mild chocolate brown crelly. Now this color is yummy! 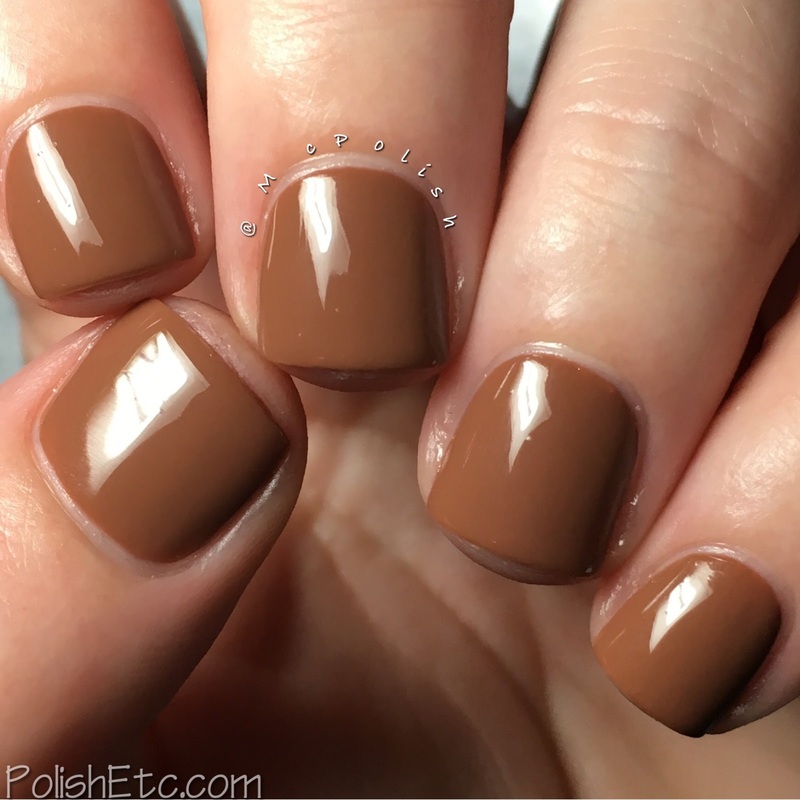 This is a nice shade of brown that actually looks like mild chocolate on your nails. The formula is a little squishy so I needed three coats to even everything out. It was pretty glossy on it's own but I added a glossy top coat for this swatch. What do you think of this collection? I enjoyed it. My faves are Guys and Dolls and Moose. If you like any of these, head over to the Whimsical Ideas by Pam Facebook Page for ordering. Pam takes all orders via email and all bottles are $10 each. Those are both great colors as well.